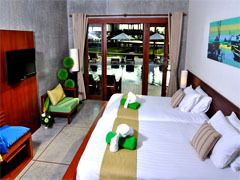 Working Hotel Partner, Holiday Inn, Aonang : The contemporary boutique resort of Holiday Inn, Aonang is located on the south coast of Thailand, just 30 minutes from Krabi International Airport, on the delightful Ao Nang Beach. 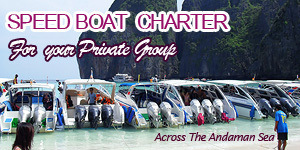 Unlike nearly all of the other resorts in Krabi, we are actually right on the beach, surrounded by lush tropical trees and greenery. We are one of the newest and most contemporary of the resorts in Ao Nang, with 59 rooms and suites in two low-rise wings framing the largest swimming pool in Krabi. 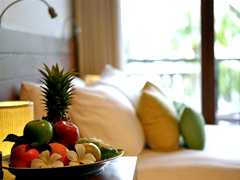 All our boutique rooms are elegantly furnished in a simple and attractive contemporary décor, and most have views over Krabi’s Ao Nang Bay. 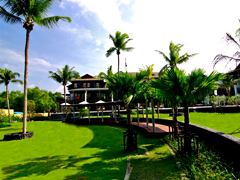 Every moment with us will be touched by our delightful natural surroundings – living comes easy when you enjoy the simple life at Holiday Inn, Aonang Beach. Relaxed tropical living comes easy with Sala Talay’s 59 luxurious and well-appointed rooms, all with pool and ocean views. 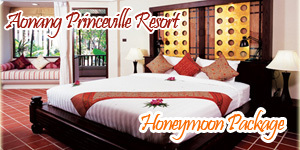 There are 20 Deluxe rooms located on the 2nd floors, and another 12 Grande Deluxe – Sea view rooms on the 3rd floors. 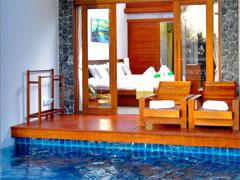 We also have 21 Pool Access rooms on the 1st floor, with the swimming pool right outside your door. 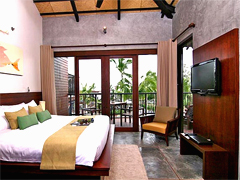 And there are 4 Mangrove Suites on the ground floor, too, plus two Penthouse Suites right at the top – both of which have their own private pools. 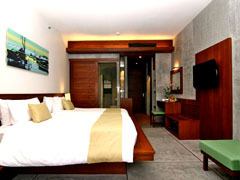 The Deluxe rooms, located on the 2nd floors, are spacious, and with bold, yet simple, contemporary styling and decor. Each has a minimum of 45 square metres of living space and come with a choice of either one king-size bed or two singles. 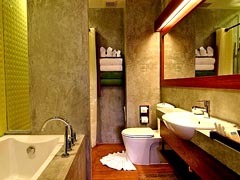 They feature an exclusive separate bathroom with Balinese-style tropical shower. Also consisting of 45 square meters , these outstanding rooms are located on the 1st floor and they allow for intimate privacy with direct access to our large swimming pool and Pool from your doorstep. 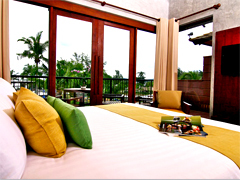 They also include private sun lounge areas on your very own balcony. 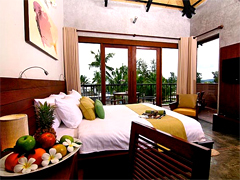 Forget about time, in the privacy and seclusion of the Mangrove Suite. 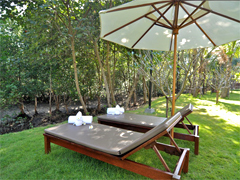 There are two bedrooms, separate living and dining rooms, and 95 square metres of spacious luxury, opening out onto the breathtaking scenery of our garden with its bushy mangrove. The bathroom consists of a separate bathtub and tropical shower (‘Balinese’ -style) which provides the final ingredient for a blissful holiday, and is perfect for the needs of a family who want to ‘get away from it all’! 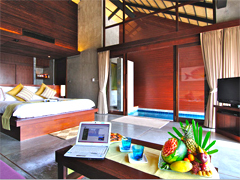 Consisting of 65 square metres of living space, these spacious rooms are located on the 3rd floors. 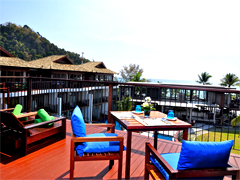 They not only have stunning views across Ao Nang Beach, but also boast a big private sun-balcony. 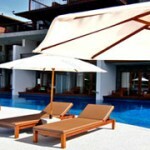 With a dreamy daybed, it’s perfect for relaxing and sunbathing. The last word in luxury and spaciousness! There are 95 square-meters of floor space, in a one-bedroom suite on the roof top floor. 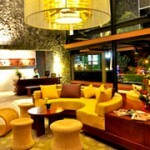 The d?cor is fresh, stylish and modern, and the huge balcony overlooks the swimming pool and the sea. 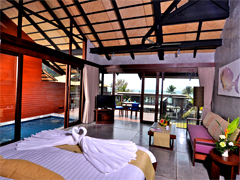 Make the most of your stay, with the large balcony dining-area, private plunge pool and Jacuzzi! 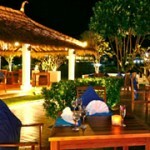 Breeze Grill and Wine : On the roof top of the reception building, overlooking Ao Nang Beach. 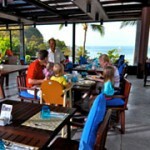 The beach front restaurant on Ao Nang Beach. Wave Bar : Drinks By The Sea” has fantastic sunsets and a fine selection of chilled cocktails, beers and wines by the glass. The panoramic ocean and beach view at the beach front bar. Seating for 30 people. Open daily from 11:00 am to 11:30 pm. POOL BAR : Conveniently located by the pool and ideal for enjoying a variety of light snacks, drinks and finger food. Seating for 20 people. Open daily from 11:00 am to 07:00 pm.